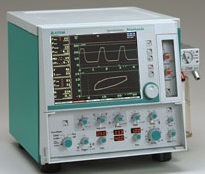 Stephanie, a device developed by the German company Stephan, is the only ventilator that allows Proportional Assist Ventilation (PAV) in neonates, and has been sold in Japan since October 2002. It is a ventilator with extremely high potential—for instance, it is equipped with PAV as well as its own backup ventilation mechanism to support that, and furthermore, HFO (high frequency oscillation) and respiratory function measurement are also available. 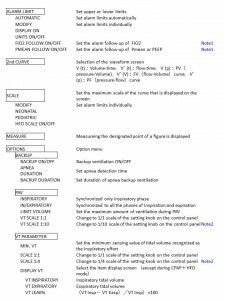 Most of the long-term respiratory management of extremely low birth weight infants at the author’s institution is performed using the PAV mode of this unit. However, there is a steep learning curve for users who are not familiar with usage of this unit, including the requirement of a system check at the start of instrument operation, requirement of its own heated humidifier, and vulnerability to condensation in the circuit. 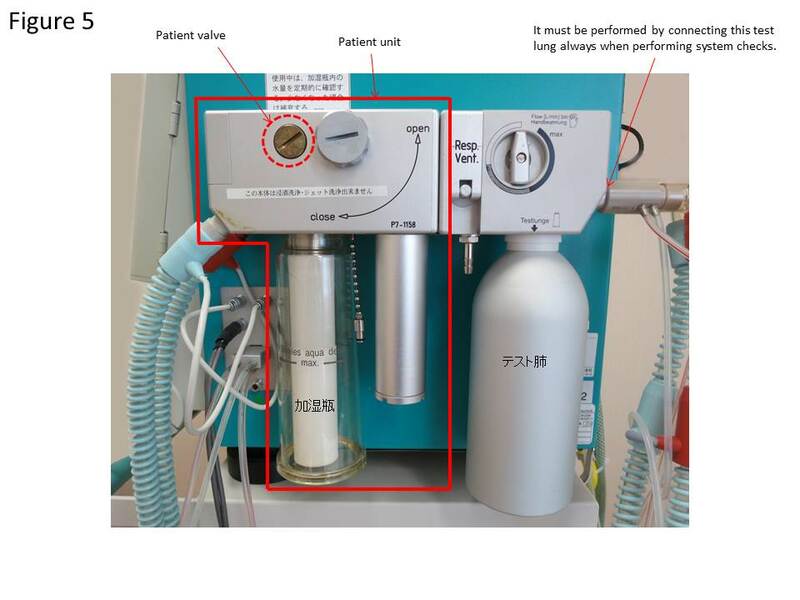 In January 2009, this ventilator was discontinued in Japan; however, due to the high potential of PAV, similarly to HFO, in forming a new respiratory management field, its domestic discontinuation is extremely regrettable. 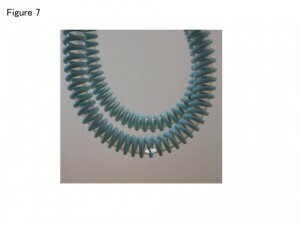 Here, we will explain the basic usage as well as cautionary points for its usage. 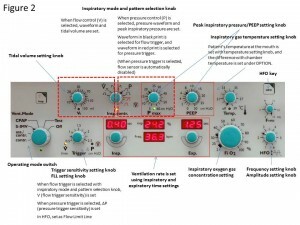 For basic respiratory modes, continuous positive airway pressure (CPAP), synchronized intermittent mandatory ventilation (SIMV), Assisted/Controlled ventilation (A/C), and Controlled ventilation (Contr.) are available, and these are selected using the operating mode switch on the lower left of the Control Panel. Pressure regulated volume control (PRVC) called pressure control and flow control (or flow volume control) are available for basic ventilation control, and for the latter, configuration of the tidal volume is required. In addition to this, both HFO and PAV are available on this unit, and HFO can be used in CPAP and Contr. 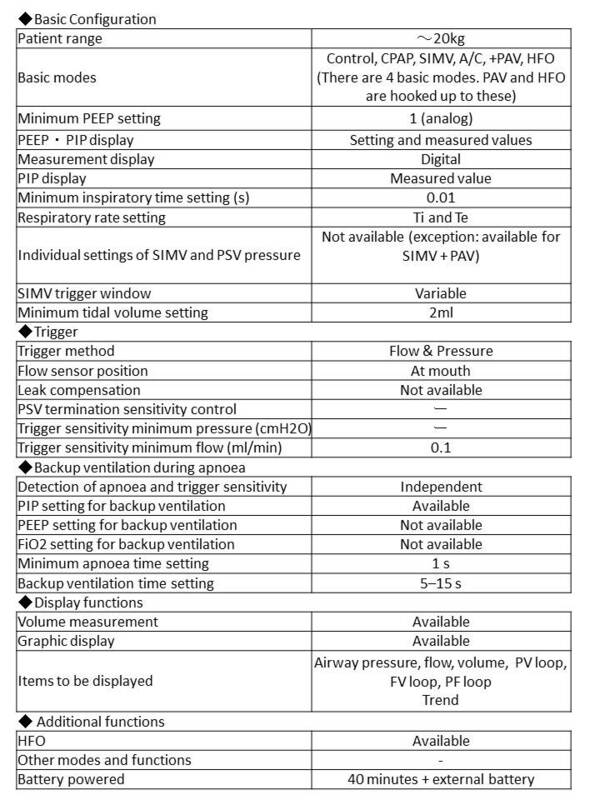 and PAV can be used in SIMV•CPAP basic respiratory modes. Basic settings such as positive end-expiratory pressure (PEEP) and peak inspiratory pressure (PIP) are configured on the Control Panel dials, and all other settings are selected using the Menu Key. When the red waveform is selected, pressure control becomes pressure trigger. At this time, the flow sensor becomes disabled, and parameters related to volume will no longer be displayed. The Menu Key is used for setting various items other than those on the Control Panel dials. Major items are composed of alarm setting (ALARM LIMIT), waveform selection on the lower part of graphic monitoring area (2nd CURVE), scale settings of the screen display (SCALE) and measurement (MEASURE) as well as OPTION to select other items. In SCALE, the scale of the screen display is set. 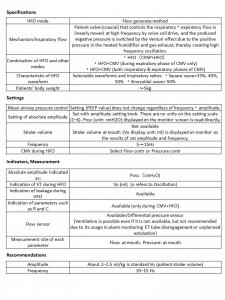 The default value is pre-determined depending on the type of flow sensor, and to modify, the scale of each item is individually set in MODIFY. 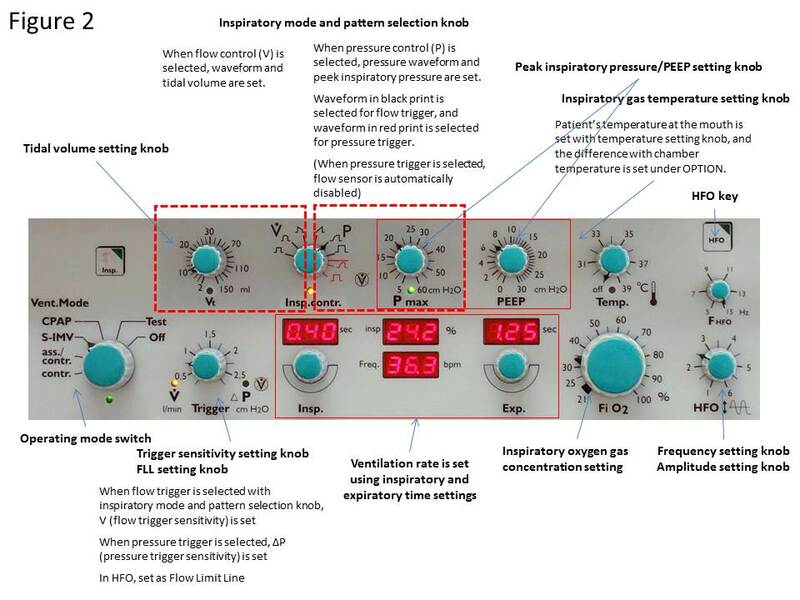 In OPTION, finer settings such as backup ventilation, PAV, and HFO are performed. 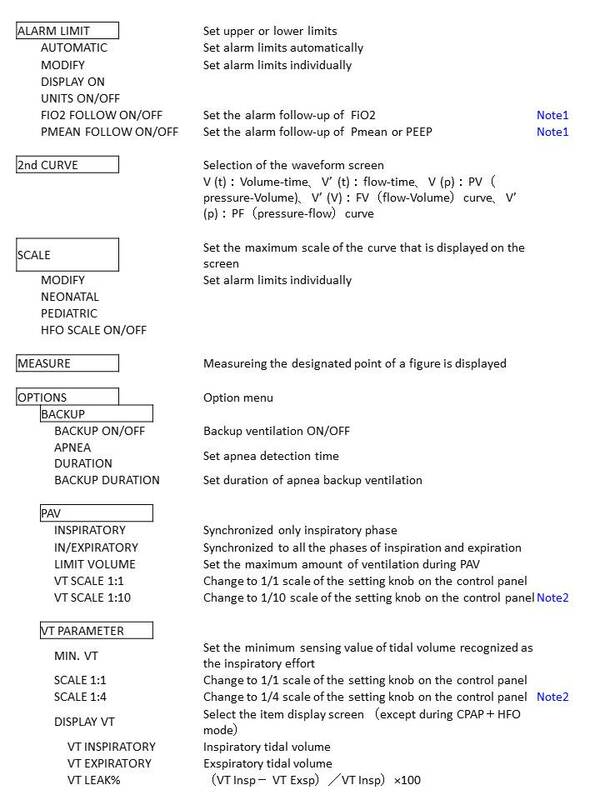 In INSP.HOLD TIME, the maximum inspiratory time during manual ventilation is selected. Although 0, 3, 5, and 7 s can be selected, when it is 0 s here, the inspiratory time during SIMV or backup ventilation becomes the inspiratory time during manual ventilation (Table 2, Note 3). HEATING and HFO are described later in this article, and backup ventilation and PAV will be described in the subsequent “advanced” article. When FIO2 FOLLOW ON is selected, ±10% of the preset FiO2 are displayed as the upper and lower limits, and when PMEAN FOLLOW ON is selected PEEP+5cmH2O is displayed as the upper limit of the alarm setting. Furthermore, in MODIFY, the time axis of the trend graph can be modified. 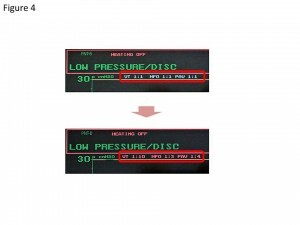 When the oxygen concentration display of the graphic screen and the oxygen concentration setting dial do not match, there may be doubt in making decisions. 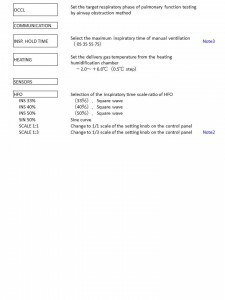 Fundamentally, the oxygen concentration display on the screen is correct, but when ON is selected in FIO2 FOLLOW here, the ±10% values of the setting value will be displayed as mentioned before, and then the oxygen concentration setting can be ascertained at that point. 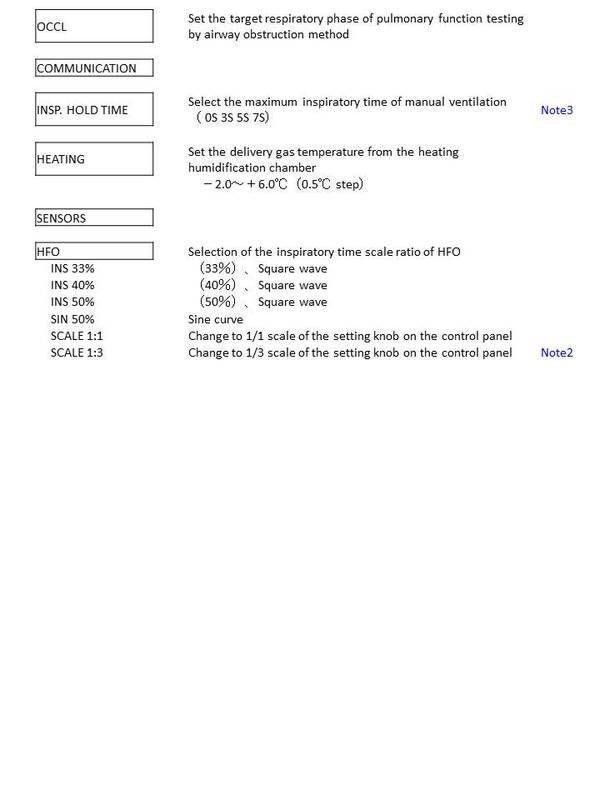 Through OPTION setting, the scale of the three types of ventilation settings can be modified. 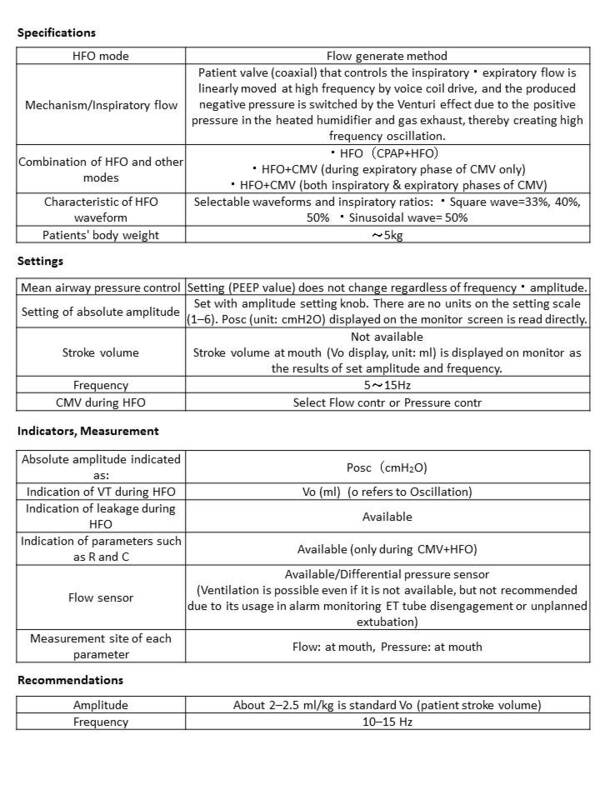 In OPTION→PAV→VT SCALE 1:10, PAV dial scale can be modified to 1/10 for both elastance and resistance; in OPTION→VT PARAMETER→SCALE 1:4, the tidal volume dial setting scale in the flow control can be modified to 1/4; and in OPTION→HFO→SCALE 1:3, the HFO amplitude setting knob can be modified to 1/3, indicating that that minute setting changes with lower setting values are possible for each type. 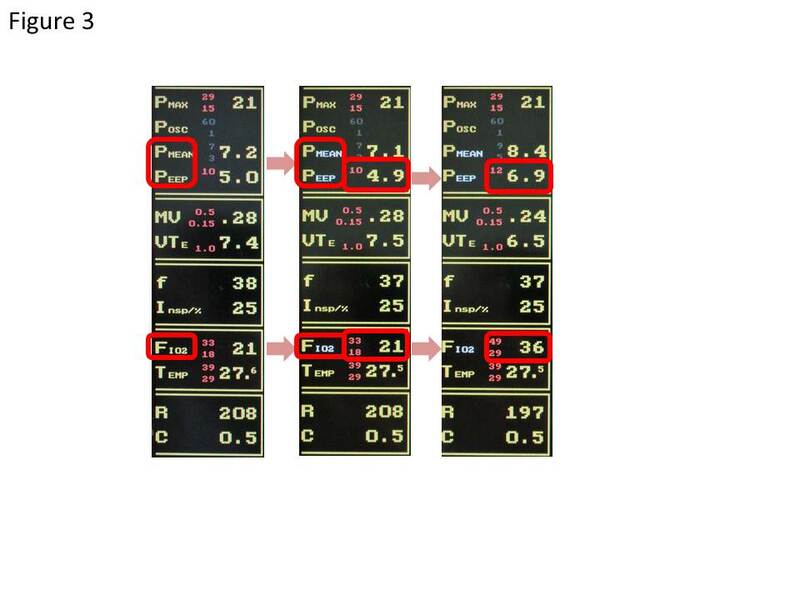 When these functions are ON, each scale that is displayed directly beneath the alarm display in the upper part of the graphic screen changes from white outlined letters to red letters (Figure 4). HFO is configured by setting the frequency and amplitude with the knob on the Control Panel or otherwise through OPTION. A frequency of 10–15 Hz is recommended, and Vo, an index of volume, of 2–2.5 ml/kg is said to be the standard. 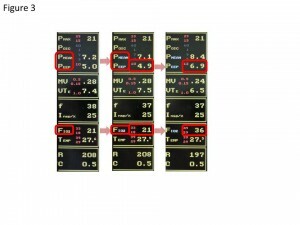 These values are slightly higher than other models, and this is thought to be due to differences in flow sensors. The HFO amplitude setting knob is displayed as a relative value, and is set while observing Posc and Vo. 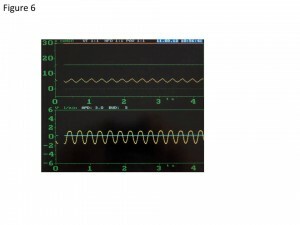 For HFO waveforms, the inspiratory ratio can be set at 33%, 40%, or 50% for square waves, and a sinusoidal curve can also be selected. Generally, in high frequency/high amplitude or relatively low MAP, the inspiratory ratio in the square wave should be set lower than 50% to prevent air trapping or atelectasis. 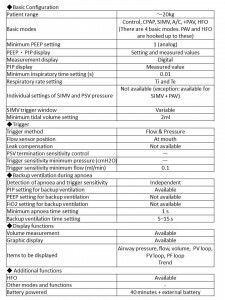 Alarm settings in modes other than HFO can all be basically set by ALARM LIMIT→AUTOMATIC, but Flow Limit Line (FLL) must also be set for CPAP+HFO. When CPAP+HFO is selected, the trigger sensitivity knob functions as the FLL setting knob, and a light purple line is displayed in the middle of the graphic screen. This FLL setting knob is turned all the way to the left (a position that is most sensitive for trigger sensitivity knob). At this point, a message that says “FLOWLIMIT/DISC. ?” is displayed, and when the alarm goes off, turn the FLL setting knob slowly to the right until the message disappears and the alarm stops. 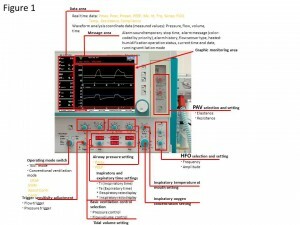 The above operation can detect not only circuit disengagement of the ventilator but also abnormal leaks. A heated humidifier for this device is built in the main body, and there are several cautionary points when using it. First, water cannot be poured into the humidification bottle when the system is not in operation, otherwise water enters the patient unit or into the flow sensor, causing normal operation to become problematic. Water must be poured into the humidification bottle after the machine starts operating normally following the test mode. Although the mouth temperature on the patient’s side is set using the inspiratory gas temperature setting knob on the Control Panel of the main body, the difference between mouth temperature and chamber temperature is set through OPTION→HEATING. Although there are two temperature sensors on the patient side, temperature is controlled at the mouth using the lower of the two sensors. With Stephanie, sometimes the pressure • flow baseline becomes “wavy”,as shown in the figure, and may not operate normally (Figure 6). There are several potential causes for this, and highly frequent causes are listed below. Accumulation of condensation in the circuit, as shown in the figure, causes baseline abnormalities. To resolve this issue, first, the circuit is removed to discard the water. However, if condensation accumulates easily, it is necessary to change the heated humidifier settings. Regardless of the mouth temperature setting, normally, OPTION→HEATING is set to –2.0, but if condensation still accumulates, the issue is resolved by lowering the mouth temperature using the inspiratory gas temperature setting knob. This unit is vulnerable to moisture in the circuit to the point that baseline waveform abnormalities appear even with a negligible amount of condensation in the circuit. However, considering that, the setting for the difference between mouth and chamber temperatures stops at 2.0°C and there is an impression that the circuit heater output itself is also inadequate. Since the environment may also greatly affect the formation of condensation in the circuit, it is important to make arrangements such as avoiding wind from air-conditioning or the window-side during winter in addition to adjusting the NICU room temperature. A similar phenomenon occurs when moisture accumulates in the flow sensor at the mouth. Furthermore, since this unit utilizes a differential pressure flow sensor, a similar phenomenon occurs if moisture contaminates the inside of the flow sensor tube; thus, it is necessary to pay attention to this point when abnormalities occur. 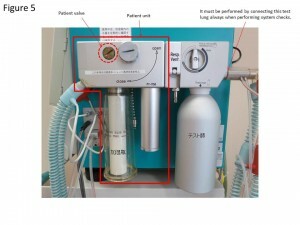 Respiratory control in this unit is performed completely by the patient valve inside the patient unit. This works magnetically under the same principle as speakers, and the baseline can become unstable due to deterioration of this valve over time. There is a screw groove that contains the patient valve on the patient unit side, and the waveform might be stabilized if this is slightly rotated with coins (Figure 5). Additionally, instabilities may occur due to abnormal operation of the patient valve when it is attached incorrectly in a bent manner. It is recommended to replace the patient valve with a new one about once a year. The cause may not always be identified even after checking the aforementioned cautionary points. 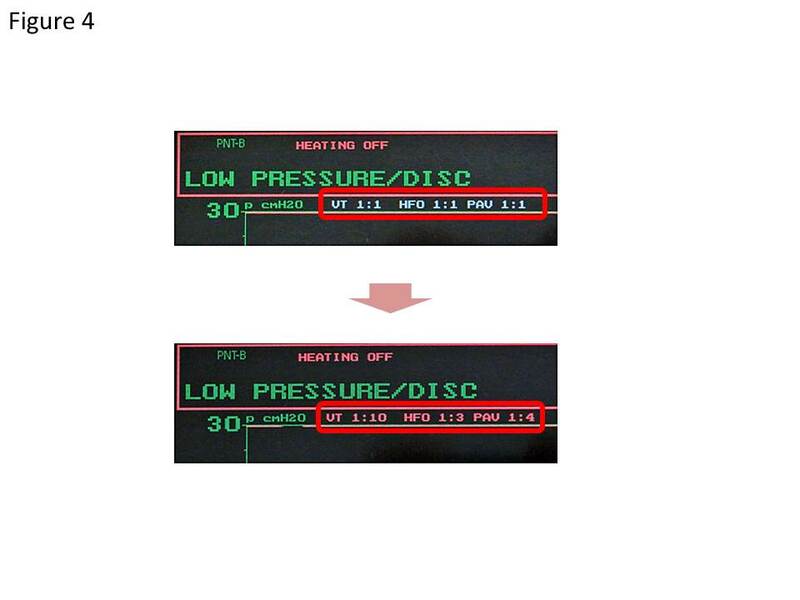 In such case, the instrument may normalize if the operating mode switch is turned to “Test” to stop the ventilation and returned to the original mode again.